Originally published by George Allen and Unwin on 9 November 1967, it was soon published in Redbook magazine on 23 November in the United States. The first state has a solid black background, and a later second state has a white border on the top and bottom edges and on the spine. The proportion of 1st to 2nd state copies is yet unknown, but observation of the copies offered for sale on the secondhand market suggests that the 1st state copies outnumber the 2nd state copies by more than 10:1. Tolkien's "Smith of Wootton Major" takes us to Farie and introduces us to the King and Queen of Fairyland, something he never does in any other story, Fantasy or Fairy tale. This story shows us a glimp in the 'real Middle-Earth', as it must have been believed to exist around the year 1000, during the Middle Ages. Even in The Silmarillion we never hear Ingw, High King of the Elves, say a single word. He is only a distant figure, a name buried in legends. And there are no elves or fairies in "Farmer Giles of Ham". Even Roverandom reduces fairies to ephemeral creatures, and grants us only a quick glance at the shores of the enchanted world. 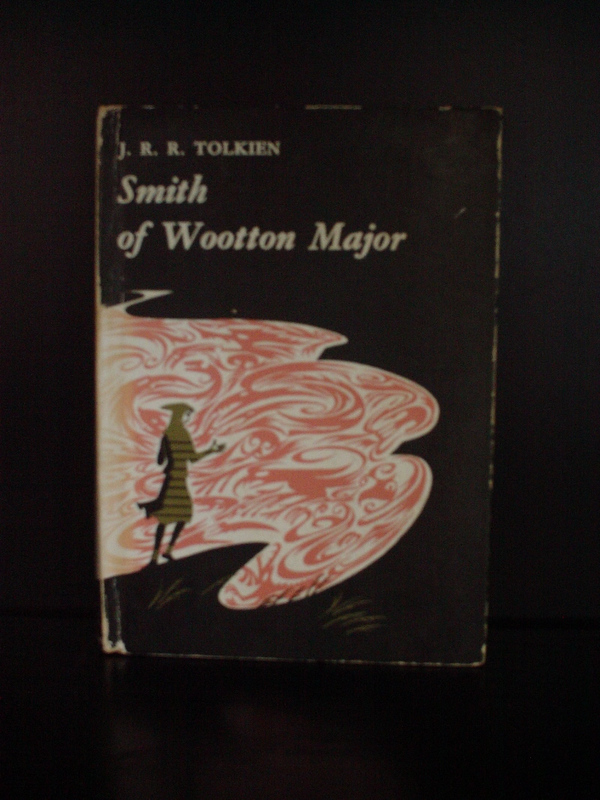 Tolkien uses metaphor in "Smith" quite noticeably, which is an unusual motif for him. He resorts to symbols and symbolism only occasionally, preferring to be straightforward with his references in most stories. So "Smith" too is a story for both adults and children, appealing to the sense of wonder on two levels. Wootton Major for some inexpicable reason has developed the tradition of celebrating the Twenty-Four Feast. Every winter they hold the Feast of Good Children, and invite all the "good" children of the village to attend. But once every twenty four years they hold a special celebration, and only twenty-four children are permitted to attend. For each Twenty Four, the Master Cook of Wootton Major must bake a Great Cake, a pastry of surpassing excellence which the children will remember for years to come. In typical medieval fashion all the people of Wootton Major are known by their professions. So the Master Cook is called the Cook or the Master Cook. When one Master Cook vanishes for a time only to come back and announce he will retire, he choose an apprentice to learn his trade. The apprentice, Alf, was thought to be too young to become a Master. It didn't help, perhaps, that he was also a stranger, someone the old Master had found outside of Wootton Major. So when the Master finally hung up his tall white hat and bade farewell for the last time, the good folk of Wootton Major selected a local man named Nokes to be the new Master Cook. Nokes was no real cook, and he had to learn a lot from Alf through the years which followed. When it came time for him to make a Great Cake, he decided on a fairy theme. Unfortunately Nokes had no idea of how to make a Great Cake, and as he puttered around in the old cookbooks left behind by the previous master, he came upon a silver star in a black box. Nokes decided to put trinkets into the Great Cake so the children would find surprises, and after Alf told him the star was fay (a thing from Farie), Nokes put the star into the Great Cake as well. At this point Smith enters the story. He is just a little boy who attends the party, and is the son of the local smith. He eats the piece of cake with the star in it and years later awakes to find himself suddenly changed. He goes through life enjoying a particular gift of skill, but also a gift of access . He journeys to Farie and has adventures there. In his mundane life Smith marries Nell, who as a little girl at his Twenty Four feast. She had sat next to him. On his journeys the silver star shines brightly on Smith's forehead, and his wife and children can see it when he returns. They understand he is an unusual man, but he seems not to realize how different he is until he learns who the King and Queen of Elfland are. And he is given a great choice: deciding to whom the star should pass. The silver star is the key to Farie, opening doors that ordinary mortals cannot see or comprehend. And it is a gift to the people of Wootton Major from the King of Farie. Each child to whom the star is given shows some special quality already, and the star helps nourish and enlarge that quality. The Great Cake and the Twenty Four Feasts are thus symbols of the passing generations, and the star is the gift of the Wise to the Wise. The tradition of imagination and wonder is bound up in both cake and star and is passed on from elder to younger so as to ensure the richness and quality of life in Wootton Major. The visions of Farie we see in the story are surreal and all too brief, but they might seem like descriptions of Valinor and the Uttermost West of Tolkien's great drama. There are high mountains, seaborne Elven warriors, and quiet woods. So as in Roverandom Tolkien shows us a glimpse of his great dream through different eyes. The celebration of the story is the story, and the story is a celebration of story. "Smith" is nothing more than a quaint tale of a man who walks on the periphery of greater stories, an observer blessed with sight the few others can share. He may not comprehend the things he sees any better than we do, but Smith understands that they are not to be taken lightly, or hoarded and withheld. So when the time comes he freely passes on the gift, knowing it will be appreciated by another. "Smith" thus represents what Tolkien was doing for his children, and all children everywhere: he was passing on the star, in his own way, to all the rest of us.